Okay, no, he’s not playing Rorschach, I just like this art. Damon Lindelof’s Watchmen TV series, slated for HBO, is a bit of a cipher. How direct of an adaptation of the comic or its world will it be, and why is there so much secrecy around the characters and plot details? How mad, precisely, will this make Alan Moore? I talked to [Lindelof] on the phone, and it was an evolving process for Watchmen, which in part is what makes Damon so interesting. He, like the Coens, is very much in control, but he also improvises, to a degree, with what he has. And so, I was approached for Watchmen by his (producing) partner, Tom Spezialy. I read it and I read my character, and I found him interesting, but one doesn’t want to leap into television without knowing where a character is headed. And Damon, frankly, said, “Well, I’m not sure about this guy and whether there’s going to be enough for you, to where you would want to play this role. I’m not sure that having you in this role would be gesturally right, in terms of the casting, with what I have in mind for him. You may be, in a sense, too big of a gun to shoot a fly.” But then, he started thinking about it and he changed his take on the role. He said, “You know what, I really would like you to be a part of this. Here’s how I wanna enlarge the role. If you’ll trust me, then I’d really like you to come on board.” What he had to say was certainly enough, but more importantly, the pilot script and what it seemed like he wanted to address with the show, which is way beyond your run of the mill comic adaptation, really intrigued me. 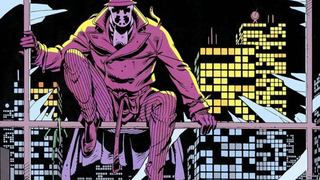 The flexibility of the plotting here, which allows for new characters to grow with the writing, is in keeping with previous reports that the show will take place in a part of the Watchmen timeline somewhat removed from the fixed plot of the comic, making this more than just a straightforward adaptation. It also indicates, along with rumors about the casting of talent like Jeremy Irons, that the cast is going to be superb. Will you be watching the Watchmen in 2019? Sorry. Sorry, I had to. I’m really not sorry.